It’s the kind of headline meant to grab the attention of the president: "Say Goodbye to the Filet-O-Fish." 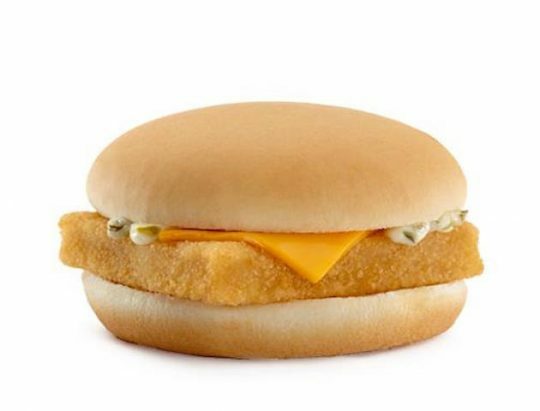 The New York Times op-ed by Bren Smith, Sean Barrett, and Paul Greenberg warned that the proposed cuts to the National Oceanic and Atmospheric Administration had implications for the pollock, the fish used in McDonald’s Filet-O-Fish, which Trump has lovingly called the "fish delight." And a delight it is, which is why the headline grabbed my attention as well. Sure, the filet itself can have a bit of a rubbery texture, but the steamed sugar-bun and the tartar sauce with just the right amount of tanginess and that half-slice of melted cheese make the overall product irresistible to many: Actor Nick Offerman, who is otherwise a fierce critic of the Golden Arches, admits to eating them on the road. Speaker of the House Paul Ryan has been known to occasionally indulge in the Filet-O-Fish as well. And at 390 calories and 17 grams of protein, what better way to reward a P90X workout? Smith, Barrett, and Greenberg contend that the Trump administration’s proposed 17 percent cut in funding for NOAA and its subsidiary, the National Marine Fisheries Service, will have an adverse impact not only on the president's sandwich, but also the fishing industry. "Federal observers oversee 99 percent of the large trawlers fishing for pollock, ensuring that this largest of fisheries maintains an impeccable set of management tools," they write. "Any funding for NOAA programs that help consumers reconnect to clean, healthy, sustainable seafood swimming off our shores is funding that we cannot afford to lose." One of the fears is depleting the ocean of species through overfishing. This was the concern over swordfish (remember when it seemed like almost every restaurant had swordfish steak on the menu?). There was also the panic over oysters, but in the Maryland region, after years of careful monitoring, the oyster is back and better than ever. Have you sampled White Stones yet? The Seafood Harvesters of America, which represents the interests of commercial fishing, also issued a statement regarding proposed cuts to NOAA. "I fear that budget cuts could lead to less information, less certainty, and thus lower quotas to fish, which will devastate fishing communities along all of our coasts," said Chris Brown, president of Seafood Harvesters of America. "We need more, not fewer, surveys of our fisheries, so we can have accurate stock assessments—the lifeblood of sustainable fisheries." In the Times, Smith, Barrett, and Greenberg point out that "only around 9 percent of the seafood available in American markets comes from American fisherman." It’s something Paul Greenberg expands on in his very readable book, American Catch: There’s a good chance some (if not most) of the fish you eat came from a farm in China or Vietnam. And that can’t be good. But no one’s arguing that it is. Secretary of Commerce Wilbur Ross and the president want to stopping the flood of cheap, imported fish and defend the American fisherman. But they are also trying to trim the size of government and reduce inefficiencies and redundancies. "At the end of the day, the National Marine Fisheries Service (NMFS) line items related directly to fisheries management were not significantly cut," says Molly Block, spokeswoman for the House Natural Resources Committee. "The major reductions targeted duplicative climate-science programs that one could easily argue belong elsewhere than NMFS." According to the president’s budget brief, the programs cut "are a lower priority than core functions maintained in the budget such as surveys, charting, and fisheries management." In other words, the pollock might still be safe, and with it Trump’s beloved fish delight (not to mention fish sticks, which according to Mark Kurlansky in Cod, consist mostly of Pacific pollock). But I have to hand it to Smith, Barrett, and Greenberg: It was a brilliant way to catch the attention of this president—by aiming for his gut. Because if there's ever a Filet-O-Fish shortage, there will be hell to pay. This entry was posted in Politics and tagged Donald Trump, Filet-O-Fish, McDonald's. Bookmark the permalink.